Capacity crowd from both local and abroad filled the top deck of SCG building awaiting arrival of the pigeons. Mr. Dhanin Chiaravanont, CEO of the world renowned C.P. Group and our Chairman of the race personally came to grace the occasion despite his never ending tight schedule. He sat and waited the whole three hours along with our European Chairman, Gommaire Verbruggen, who flew in directly at his own cost from Belgium after only 2 days of rest following the latest trip to China. This is a real friend who values friendship before business. Thanks to C.P. Kitchen of the World, fanciers and guests were pampered with sumptuous food for the whole afternoon. The expected arrival time was around 4.00 PM but the pigeons took longer time when the first two arrived together at 4.24 pm and followed 51 minutes later by the third prize winner. All three pigeons are small hens from local fanciers. The first prize and King Cup winner belongs to Mr. Vinai Kamolkasemsilp. She had only eight primaries on one wing and nine on the other. The strain is a combination of Erik Limburg and Andre Litare. Second prize owner is Mr. Viboon Kulwuthivilas a local fancier who excels in long distance racing but not heavily advertised. She is a blue hen in perfect condition with outstanding record in the past two hotspots worthwhile for the Ace pigeon title and winner of nominated birds team. The pigeon is from Marc Roosen and Janssen cross. The third pigeon, also a little hen with nine flights on each wing, belongs to Techavichian-Veulemans combination which had three in the day. International entries performed extremely well despite being out numbered. There were five of them in the 17 day birds starting with the 5th prize of Mr. B. Pot from the Netherlands and the 6th of Loft 24 Team from Belgium. They are the first and second from among all European contingents. Therefore, the Queen Cup goes to the honor of Mr. B. Pot.? Andre Verbesselt also shined in this race with his two Marcel Albrecht hens coming in 10th and 12th while Belgiga-Deweerd stood in the middle at 11th.? By 10.18 AM of the following day, all 60 prizes were filled. The clock was kept running until day end and 151 pigeons were clocked including 16 pigeons from international teams which featured top names in the sport such as Chris Hebberecht (last year winner), Marc Polin, Deno-Herbots Brothers, Jos Vercammen, H. Eyerkamp & Zoon, Gommaire Verbruggen, Kris Clerbout, Harry Boxmeer and C & G Koopman, Norbert Norman & Filip, Moulin Rouge, to name a few.? We firmly believe that, besides good pigeons, luck plays a big role in all one-loft race racing. Many good pigeons of excellent pedigrees might not make it this time because of factors such as accident, sickness, not in proper form at the right time, etc.. Weather condition also has a decisive role, if not the most important of all. One sure thing is that pigeons that have passed the kind of our final race are all to be reckoned for their intelligence and stamina. It was noteworthy that most, if not all of the pigeons that performed well were small hens from long distance strains but they have never been in the lime light in past training or racing. The fast middle distance pigeons that did well in the past three hotspot races did not fare well in the last race either. May be, we were expecting too much from the youngsters in their first year of age to endure such a strong test. 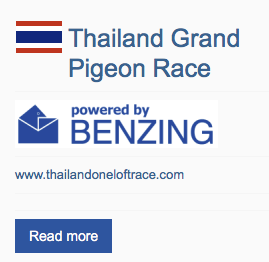 Despite vigorous training and racing program, pigeons that were sent to the loft in January also started to drop feathers when the cold spell hit Bangkok. The evening of Sunday 6th was the occasion to host a casual farewell party in the garden of Montien Riverside Hotel. We all enjoyed the good food, friendly atmosphere and great music by a popular band.? The genuine King cup was presented to the winner along with the Queen Cup and other trophies to respective winners. Eight top prize winning pigeons were also put on auction. The first and second prize winners were sold to local fanciers at Baht 400,000 and Baht 500,000 respectively.? There was no price fixing to inflate phony figures. All other pigeons also commanded very respectable prices. 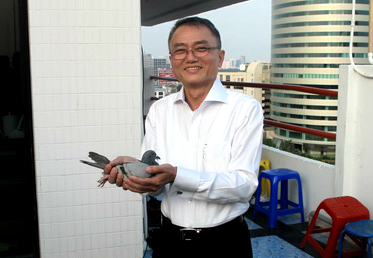 It is a pity that, due to the AIV record, pigeons can not yet be exported to China and other countries. Otherwise, we could have had a better record as our friends from China were also present at the auction. We take this opportunity to thank you all for your support and understanding and we hope that you will again participate in our next year race. Detail of the program will be announced in this very near future but there will be no major deviation from the present one except for our intention to give a better deal and to contain the final race distance to no more than 540-560 km. Final race day will be in the second week of December. We recommend that you send your team as soon as possible and not to wait until May. All pigeons must be vaccinated with reliable paramyxo, paratyphoid and pox vaccines at the right occasion as advised by your authority. Do not send any thing younger than 40 days at least.